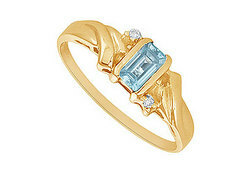 An octagonal aquamarine is set at the center. Two round diamonds on both sides of the gem add a touch of style. Made in 14K yellow gold this ring has a total gem weight (TGW) of 1.00 ct.